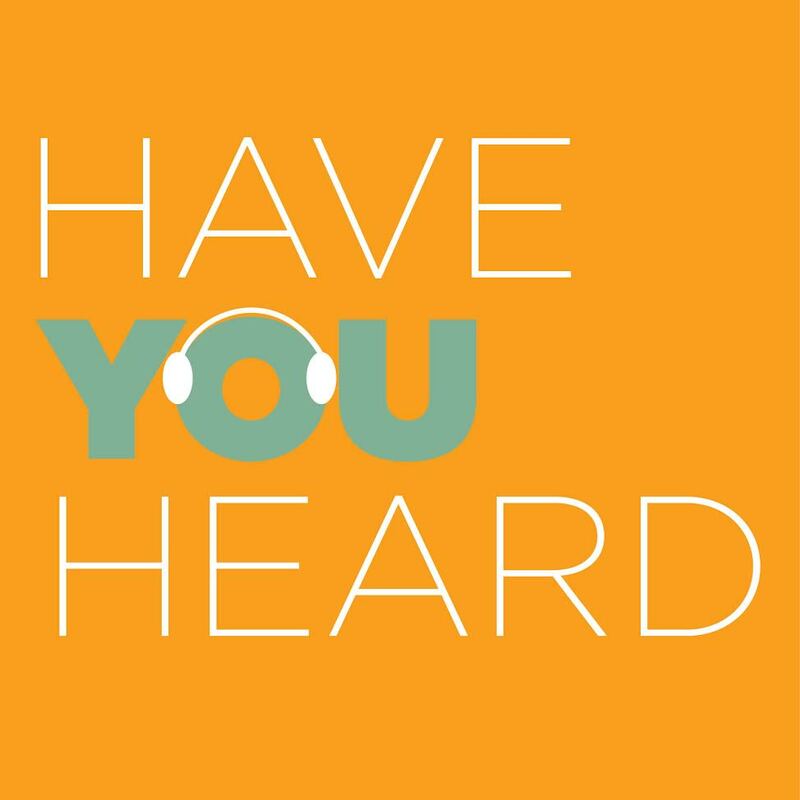 In this episode of Have You Heard, we talk to Tressie McMillan Cottom about the rise of for-profit colleges, and *risky* higher ed that saddles low-income students with debt and questionable credentials. And we discuss the growing push to make K-12 more risky, including busting up public institutions and shifting the burden of choosing an *education option* as Betsy DeVos likes to call it, onto parents. Cottom’s new book Lower Ed is a must read, and this episode of Have You Heard is a must listen. As she points out, the same free market that we’re now entrusting with the futures of kids and adolescents also gave us cheese whiz. Cottom’s book and our conversation threatened to deplete my store of adjectives (*fantastic*!) and inspired Jack to make one of his famous charts. Jennifer Berkshire: Welcome back to another episode of Have You Heard. I’m Jennifer Berkshire. Jack Schneider. : And I’m Jack Schneider. Jennifer B.: And today, we’re going to be talking about for-profit higher ed. Jack S.: I’m calling this episode “When Things Don’t Go According to Plan”. Jack S.: That would be the boardroom. Jack S.: That’s good, I hope you bought the whole index. Either that or I hope you bought just stock in for-profit colleges and universities, because you’d be doing well. Jennifer B.: Exactly. If you happen to be an investor in for-profit universities, you are going like gangbusters right now. Some of the big ones are up like 25, 30% and sort of reassuringly to investors, I saw a line somewhere that this administration is not expected to go after for-profit universities the way that the Obama administration did. Jack S.: Well, that’s what happens when the founder of a for-profit university is suddenly elevated to commander-in-chief. Jennifer B.: We have a special guest that we’re going to have on in just a few minutes. We have Tressie McMillan Cottom coming on. She’s the author of a fantastic new book called “Lower Ed” that chronicles the troubling rise of for-profit higher education. But Jack, as our expert on all matters historical and higher educational, I wondered if you could just bring us up to speed on where all this comes from? Jack S.: You want me to go into the time machine? Jack S.: Do we have a sound effect yet? Jennifer B.: We’re almost there. I’m working on it. Jack S.: Okay, all right. So historically, we have seen more and more Americans attending and graduating from college basically each decade over the 20th century, and eventually what we started to see was a level of saturation at public and private colleges and universities that created a market opportunity that was seized upon by for-profit providers who wanted to cater to a market of students that either was unable to access traditional higher education because of reasons of schedule or geography. One example here would be the University of Phoenix sold a lot of degrees to members of the Armed Services, because members of the Armed Services need to have a Bachelor’s degree in order to become officers, so this is pure credentialism. Another example would be catering to students who do not possess the qualifications to have earned a spot in traditional colleges and universities, and these are students who either did not earn a spot because they didn’t possess enough information to get the spot that otherwise might have been theirs, or didn’t have the credentials and background that would have gotten them a spot at a more reputable college or university. These are students who, unlike members of the Armed Services who in many cases knew exactly what they were getting when they paid for a credential, these are folks who really have been exploited, and so what we see is a six year graduation rate. We often look at a six year rate rather than a four year rate because things happen. Six year rates at for-profit school are roughly a third of what the six year graduation rate is at public and profit non-profit colleges and universities. This is what got them into trouble, the fact that they were graduating very few of their students and returning quite a bit of value to their shareholders by helping students rack up a tremendous amount of debt. According to one report, about a quarter of the graduates of for-profit colleges and universities were graduating with over $40,000 in debt, and this is actually contrary to what one might believe given the sticker price of colleges and universities. Most students do not graduate with that much in debt, because of course if they can’t afford to pay room and board at a college or university they’re often covered through grants, financial aid from the institution itself, and then through subsidized loans, and so eventually the federal government stepped in around for-profit colleges and universities, and we’re seeing them now step out. Jennifer B.: We are seeing them step out. I can’t say enough good things about Tressie McMillan Cottom’s new book called “Lower Ed”. It’s one of those books where, even though it’s ostensibly just about for-profit higher education, it’s relevant to such a broader sphere these days. It’s really about the shifting of risk. We’re so familiar with how risk has moved on to ordinary people as far as retirement and healthcare. It’s up to you to take your little nest egg and go and figure out how you’re going to live when you can’t work anymore, how you’re going to pay for healthcare, but increasingly that’s the law of the land in education too. We’re going to be talking about it in terms of higher ed, but it’s also more and more when you hear people talking about school choice and vouchers and taking their education savings accounts and the dollar’s following the child, it’s about shifting risk away from an institution, away from a system, onto the individual and you just chronicled for us how in relatively short order that way of thinking has really gone badly for a whole sector of the population. Jack S.: Yeah, it’s interesting to hear you say that. There’s often an argument that is made by free market evangelists in education that the consumer knows best, and of course sometimes that’s true, but often it isn’t true and particularly so in higher education where often people don’t understand that a degree is not a degree is not a degree, right? For instance, when you talk with people about what they think a college degree is good for, they’re often not aware of the fact that a college degree is an indicator to employers of hard skills as well as an indicator of soft skills, but of course the school you went to shapes the degree to which your diploma actually indicates something. What we see for instance is that investment banks recruit almost exclusively at Ivy League campuses not because they think that those students necessarily possess the hard skills, but because they possess the soft skills including being a good cultural fit for their corporate offices. Jennifer B.: The old cultural fit. Jack S.: The cultural fit, which is something that they sometimes get sued for. Jennifer B.: Well, as is so often the case, I feel as though you and I could just sit here for hours just chattering away. Jack S.: That would make a good podcast, I think. Jennifer B.: Once again, we turn out to be possessed of just immense expertise about the particular topic, but since we actually have an expert coming on to talk, should we summon her forth? Jack S.: That sounds good. Jennifer B.: All right, we’ll be right back. We are back, and we’ve got with us on the line Tressie McMillan Cottom, the author of a new book called “Lower Ed: The Troubling Rise of For-Profit Colleges in the New Economy”, and Tressie, I just want to say that I am perhaps your biggest fan. I’ve been encouraging anyone I meet to read your book and it’s threatening to exhaust my store of adjectives. Jack and I were talking before the break about the whole concept of risk that seems to underpin your argument, and I want to get you to just jump right in and start talking about risky credentialing and where this idea comes from, and what you think it means for people who are now being riskily credentialed. Tressie McMillan Cottom. : I had one major problem doing this work and writing this book, and that’s that people may have felt some empathy for people who enroll in for-profit colleges and maybe had a negative experience, but they did not in any way feel like that was their problem. I had this challenge of getting people to try to understand why the expansion of for-profit colleges was really this collective social problem. The idea of risky credentialing, actually I borrowed the framework of risky social programs from Jacob Hacker, who had argued that one of the conditions of working in the new economy is that workers are increasingly responsible for things that employers used to be responsible for. In his book, he talks about how there’s this shift from pensions to 401(k)’s for example, or for company sponsored healthcare to HMO’s and healthcare savings accounts. He called this risky healthcare and risky retirement. This is all part of the same thing of shifting the responsibility for training the labor force from the employer to the worker. It’s this sort of credentialing how insecure that makes people feel that motivates them to take on high-risk, low-prestige, high-cost credentials as part of that sort of overarching shift. Jennifer B.: What comes out so clearly in the book is that it’s not just that the shift has taken place, it’s that the process of credentialing never really stops, right? Every day we read about another kind of job that’s about to be eliminated by a robot, and so it’s now the onus is on us to be constantly anticipating changes in what’s going to happen as far as demands of the economy and re-training. When you think about how far back this goes now, you’re supposed to be thinking about this if you’ve got a kid in elementary school, you’re supposed to be anticipating what kind of job should she be preparing for now and start her credentialing early. It’s constant. Jack S.: Which of course creates a tremendous market opportunity and particularly, if you are willing to do things that non-profit, public K-12 schools and public universities and for the most part non-profit private colleges and universities have been unwilling to do, promises they have been unwilling to make that we have seen for-profit providers happily make over the years, whether it be something as trivial as Cliff Notes and the promises associated with what you’ll be able to learn from their little for-profit scheme, all the way up through for-profit higher education and the promises about jobs that they make that their more ethical counterparts are simply not willing to make, and the kinds of incentives around this that the market is really cultivating. Tressie M.C. : Absolutely. It is easy to promise that education will solve all of your problems when you are not held socially responsible for education not solving all of your problems. The real thing I get this question a lot about, why don’t community colleges do X and it seems like the real problem’s traditional education, and I will point it out all day long but there are no innocent parties in the expansion of market based education. I do suggest to people that one of the reasons that we’re not able to be as quote-unquote nimble or responsive to some labor market trends and some social inequality trends is precisely because we have an ethical commitment to what we will and will not allow students to do. That’s actually not something that we should be quick to dissolve for the sake of being more efficient in identifying people’s talent so that we can sell them things. Jack S.: Tressie, I’ve got a follow-up question, because you mentioned traditional colleges and universities and I’m thinking about community colleges, which you mentioned there. One of the arguments that you do hear is that the graduation rates at many for-profit colleges and universities are higher than the graduation rates at community colleges, and I know how I would respond to that and I know the plan that I would propose in terms of improving two year public and non-profit private colleges, but I’m wondering how you would respond to that? What do you think the cause of the current failure of the community college system is, and what do you think the solution to that problem is? Tressie M.C. : Well, I think the first thing is that there isn’t a problem, there are multiple problems. First, I would probably start with the context of the challenge, which is that for-profit colleges do a better job of graduating students who are very similar in important demographics than those who attend community colleges. That is true, depending on how you look at the statistic. Now, the statistic does not account for the fact that a significantly higher proportion of those who attend for-profit colleges will drop out, so they do a better job of graduating those who persist, which is a bit of a complicated win. It’s kind of like the argument that people make about charter schools who do a better job at graduation, but then you’ll see something like a 50% drop-out rate between the first year as opposed to the fourth year. For-profit colleges have a sort of similar set-up. Having said that, community colleges have a few challenges to doing what for-profit colleges do exceedingly well, especially for students who have some sort of conditions related to poverty. It is almost impossible to get over how important in what the students I talked to in the course of this book that when they called their for-profit college a person answered the phone, and that’s a really weird thing when I say this to middle class audiences. It’s hard for me to communicate to them how much that means to people, but it’s essentially an example of how flattening the bureaucracy, limiting how much bureaucracy students encounter from their first point of contact with the college means to how well they’ll do with getting admitted, enrolled, and persisting through graduation. Now, that’s not new. We know that students respond well to that sort of what we used to call intrusive counseling, which is basically having somebody kind of hold their hand through the process, but again with community colleges the problem they face is how reliant they are on public subsidies to offer what is essentially a labor intensive class set. It is true that I think there’s certain things that they can do at the front line that could eliminate some of that bureaucracy. The other thing is that we are going to have to reckon with the fact that for a lot of the students that I talked to who attended for-profit colleges, one of their main reasons for doing so is that they could do so quickly. The issue of time is one that is not just about personal preference. The time issue is about again, how economically insecure people are. They need or want the credential quickly so that they can try to get the benefit from the credential quickly, meaning get a job, a new job, the promotion, et cetera. When you’re still tied to the semester or quarter credit system as public higher education is, we’re just never going to be able to compete on the grounds of getting students through quickly. Those are two of some of the biggest. Each of those in their own way related to investment, but also just about what we think college should look like. Jennifer B.: We’re talking to Tressie McMillan Cottom about her fantastic new book “Lower Ed”, and Jack is bouncing up and down. He has a follow-up question. I promised him he could ask it. Tressie M.C. : I don’t see him bouncing up and down, but okay. Jennifer B.: Then we want to hear a little bit more about your experience, because that’s so key to the book and how you approach this whole question. Jack S.: I just wanted to follow-up and say it’s really interesting to hear you identify a piece that actually is effective in terms of the usefulness of the market, so that the market does figure out what works for individuals. It can figure out their preferences and it does promote experimentation with different kinds of practices. Jennifer B.: Well, I think we can just end the show there then, because the market works. Jack S.: The market works, but of course then there’s this other piece which is that an education is not the same as a box of cereal, and so there are very clear limits to what personal preference is able to help dictate in terms of effective practices. Tressie M.C. : Yes. I think that we have gone too far, just sort of writ large, the idea of academic capitalism or this borrowing the market ideology and the logic of the market into higher education. I’m with you on this one. I don’t wholesale reject the idea, but as I tell people, personal preference also gives us things like Cheez Whiz, but that doesn’t mean that we think that Cheez Whiz is something that should be publicly subsidized and routinely distributed to all people. There is this balance between what the institution is supposed to do, which is to sort of protect some of the core functions of education from the ravages of the market quite frankly, but to extract from that like you said what it can do well. And if there are certain things that we can do well with the efficiency of helping people, then absolutely, but you can’t forget what the desired effect is. We have unfortunately adopted a fetish for being efficient without remembering that the efficiency was not the goal in and of itself. It’s supposed to be a mechanism for a better educational experience, and that’s where I think we get a little tripped up. Jennifer B.: One of the things that makes your book so powerful is the extent to which you draw on your own experience as a recruiter for both a beauty college and a place that you just refer to as the Technical College. Now you’re a sociologist at Virginia Commonwealth, and you use a metaphor that I thought was so powerful. You contrast the role that you play today versus the one that you played as a recruiter as the difference between a priest and a televangelist. As a priest, your job is to instill in your charges of faith in the institution, whereas in your former role it was to flog for a brand. What I haven’t been able to stop thinking about is the extent to which we’ve suddenly ended up with a situation where the televangelists are in charge of virtually everything, from our Department of Education to the gentleman who’s going to be overseeing some kind of a mysterious panel determining the future of higher ed who’s an actual televangelist. I just wanted to hear you talk a little bit more about that. When you think of it that way, you think, “Yes, it is absolutely ridiculous to think of those things as negative things, that they are helping people.” But this is where my experience sort of came into play and was very useful in my academic approach to this question. Because it’s still difficult for us to gain access to for-profit colleges as researchers, there was a lot about the process we didn’t know about, and without having worked in them previously some of the questions that I knew to ask I probably would not have known how to ask. As you point out, I had worked in enrollment/admissions at two for-profit colleges before I went to graduate school and got my PhD in sociology, and so I knew that there was a disconnect between what the institutions said was their formal way of doing business and how people on the ground actually do business. I knew that there was a gap between those two. I also had learned that the students that I had talked to over the years working in for-profit colleges did not sound like the ones that people were reporting on in the news. They were not just mindless prey, they were not stupid, they were not people just making bad decisions because they were quote-unquote low information consumers, but at the same time I also knew that they were not particularly savvy. They weren’t at the vanguard of innovative higher education, which is what for-profit colleges tell you they are. The reality was actually somewhere in the middle and was in fact way more complicated. Based on my experiences working in the sector, when it came time for me to do this research I knew one thing, which was that I needed to focus on the most important part of the process at a for-profit college. You have to focus on how they enroll students, because that is how they orient and the way they run the entire institution. When 90% of your profit comes from federal student aid dollars and you only enroll students and the only source of profit is tuition revenue, how you enroll students is the number one reason that the institution exists. I needed to pay very close attention to how the enrollment process worked, and I also needed to talk to students about how they made sense of that process. I think that’s why I asked them slightly different questions than the ones people had asked them before, and hopefully got some slightly different answers. Jack S.: It’s interesting hearing you talk through the percentage of dollars that are coming into for-profit colleges from federal financial aid, because of course that actually is evidence of a market imperfection because the free market supporters would argue that people are voting with their dollars, but of course they’re not voting with their own dollars. They’re voting with my dollars and your dollars. Tressie M.C. : That’s right, so we’ve actually removed the disincentive. The other thing that in addition I’ve talked to policy people who will say, “Well, the whole point we have this rule called the 90-10 rule that says that for-profit colleges can only generate up to 90% of their profit from the federal student aid and that 10% had to come from somewhere else.” They said the 10% was what was supposed to be the market voting on the quality of the for-profit college system, that if people attended without using federal student aid for example that that was an indicator that the institution was providing something that the market desired. Fundamentally, what we have is a system that has no market intervention. Jack S.: Right, I was just going to add that it’s further evidence of people not being particularly vociferous in their voting with their dollars, since we were talking before we jumped on the phone with you about the fact that many veterans know … Excuse me, not veterans, but current service members know that they simply need to get a credential and so once they become veterans there is a kind of mindset that might carry over about just credentialing and moving through systems, which once more speaks to the degree to which people are savvily navigating through systems and they may be quite savvy in some ways knowing, “Hey, I just need the credential to become an officer” but then are not necessarily savvy in terms of thinking through what a credential is going to get them from an employer out in the private sphere. Jack S.: Pioneers of choice. Jennifer B.: Pioneers of choice, and how you read that? Tressie M.C. : I read it unfortunately while being sober, so that was the first problem. Jack S.: But then you didn’t remain that way for long? Tressie M.C. : Yeah. The second problem was … I mean, so listen, this is actually not the first time I think Betsy DeVos, her comments while ahistorical to the point of really being ludicrous, let me just be clear. While it was certainly that, it was not unique, so I think that what she was saying was an extension, and probably why she would say it, so Betsy DeVos has been understood and I think even she would say this is accurate, a strong proponent of charter schools and other sort of market-based K-12 school providers. That argument in many places, especially in a place like Atlanta by the way where I saw this play out on the ground. When I was living in Atlanta doing this research, it was ground dealer of sort of the Atlanta school testing scandal and the explosion of charters and alternative schools in the city. All of that was happening at the same time, and I remember one of the narratives coming out of that being that these schools offer poor black parents choice, quote-unquote school choice that was equivalent to the school choice that middle class white parents had been able to make mostly by using their dollars to choose where they could afford to buy a home right, but that is giving poor black parents that same sort of option. This idea of school choice being a democratic process of course ignores all of the social inequality that shapes who has what choices. It totally neglects the idea of whether or not all of those choices are equitable relative to each other. But what it does do is it helps this administration and those proponents who believe in that reshape the idea of privatization as liberty, as a civil liberty, and that’s actually a really important step in sort of financializing and privatizing all manner of public goods. You’ve got to make the privatization seem like a civil liberty, and I think if we allow that rhetoric that DeVos was espousing there to sort of take root, as I said to someone recently, “shame on us.” I think we’ll probably lose that battle if we allow that line to stand uncontested. What Whittle did next was he started a chain of for-profit private schools called Avenues, which is a very expensive school attended by Tom Cruise’s daughter. I guess she also belongs to her mother as well. Jennifer B.: Such an important detail. Jack S.: Yeah, she has a mother I think as well, Katie Holmes. 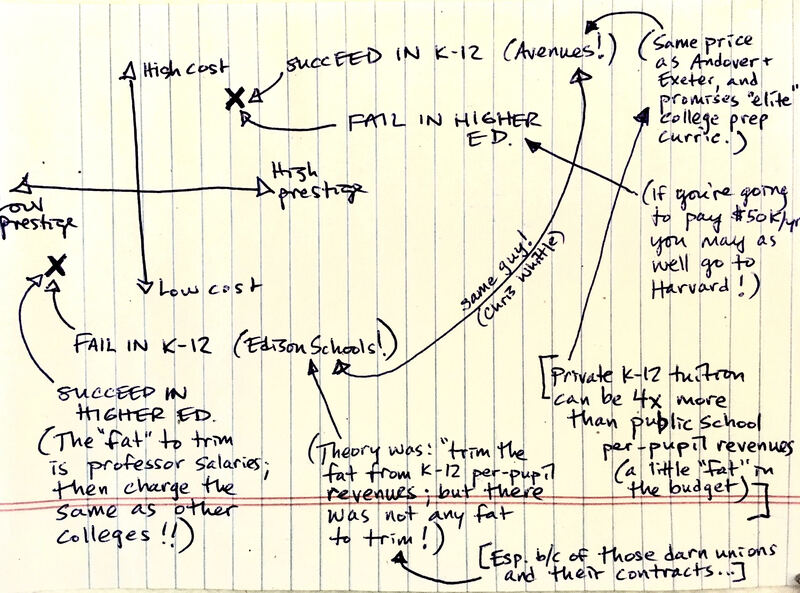 I was thinking that there’s something kind of funny there about how privatization failed in K-12 public schools but then succeeded on the very high end, and then I was going to ask you what’s going on there? It seems like one of the things I’m hearing from you is that they were unable to reshape the paradigm around how we conceive of valid and equitable choices with regard to K-12 public education and so some of the privatizers moved on, but that there is a conscious effort right now to challenge the paradigm, to challenge the notion of what is equitable and what choice is and what constitutes inequality. That means that we’ll be fighting it out not just in higher ed, but we’ll be duking it out in K-12 public schools again in terms of privatizing providership. Tressie M.C. : Absolutely, I think absolutely. If we think of education as having two poles, high prestige and low prestige, I think it’s really interesting how often actually privatization has failed at the low prestige end because they always think that’s the low hanging fruit. I think some of that can be attributed to the social class backgrounds of the people who are usually creating these entities, but at the K-12 level they’ve actually struggled with getting a significant foothold at the low prestige end. I’m familiar actually with the Avenues, I’m familiar with one in New York, part of gentrified Brooklyn if I’m not mistaken. At the top end though, they have much more success in K-12, and I attribute that to the fact that what wealthy parents really want is a level of personalization for their children, and the trade-off for having control over that personalization is that there is less buy-in into the idea of public education, but if those were the parents who were always going to send their kids to private schools then you just have less resistance. Higher education however, it’s the flip, which is that for-profit entities have had much better success with the lower end, the low prestige part of higher education, and far less success creating a high prestige for-profit. I attribute that to the fact that by higher education we no longer think of ourselves of dealing with vulnerable populations like we do in K-12. They’re children. By higher education, we still tend to think of those populations as being young adults, and I think for that reason we’re much less sympathetic to the choices that they have to make that we have allowed the low prestige part of higher education to sort of be open season for profiteering. One of the things that I hope I’m able to push back on in this book is to say that’s only because we think that quote-unquote choosing to go to higher education these days is an actual choice, when what I’m arguing is that the labor market has some structural changes and the labor market have made it much that if you want dignified work, it has become increasingly difficult to get it without any post-secondary education. That is really changing the notion that college students are choosing college and therefore should not be thought of as sympathetic figures in what’s happening with profiteering. I hope that we can sort of change that notion. Jennifer B.: Tressie, I want to thank you for letting us interview you about your new book “Lower Ed”. It inspired me to really think in new ways about the relationship between risk and education, and it inspired Jack to draw a very complicated chart that he’s been over here scribbling. Jack S.: We’ll throw it up on the website. Tressie M.C. : Please send the chart, I must see the chart. Jennifer B.: The book is called “Lower Ed: The Troubling Rise of For-Profit Colleges in the New Economy”, and you can also follow Tressie’s very lively Twitter feed at @TressieMcPhD. Thanks, Tressie! Tressie M.C. : Thanks so much for having me! Jack S.: Have a good day.